On the top deck of the Louis Cristal cruise ship bound for Havana, Cuba. Embarking on its second year, Cuba Cruise, a Canada-based cruise company in partnership with Louis Cruises, is offering new packages including charter air service to Havana or Jamaica, the main ports they sail from — and at very reasonable prices. For the winter of 2014, they are expanding their holiday packages to combine charter flights from Toronto every Monday directly to Jose Marti Airport in Havana, as well as airport transfers and a seven-night circumnavigation cruise that goes around the island. Although we can’t personallly recommend it, the cruise has received favorable reviews for the classy service and amenities on its ship, the Louis Cristal. 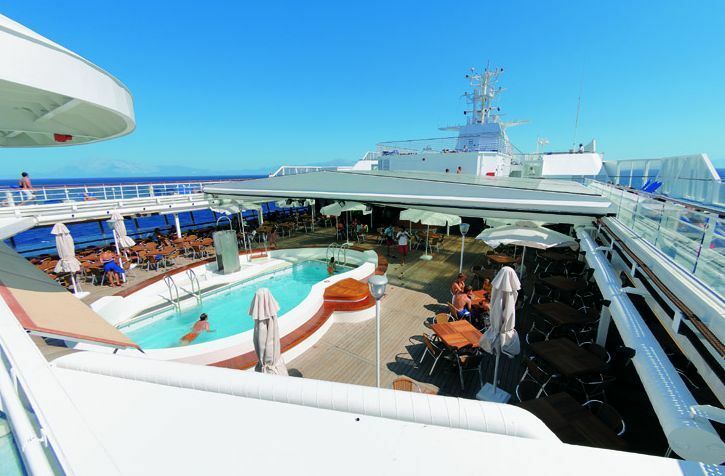 The refreshed vessel has 480 staterooms and can carry a maximum of 1,200 passengers. This personal personal account on TripAdvisor.com makes it sound like a very fun cruise experience. While Cuba is a relatively exotic cruise destination for Americans, British and other European companies have been sailing there for several years. The Cuba Cruise standard itinerary includes many ports of call of interest to all travelers, most notably Havana, Holguin, Trinidad and Santiago de Cuba, with guided excursions to the main highlights. In one week, the company boasts on its website, you will see six UNESCO world heritage sites and four of the country’s National Parks and Preserves. Families should note that each Cuba Cruise departure has a supervised children’s club for ages 4-12 operating daily. Rates include all meals and snacks on board, plus day and evening entertainment. You can spring for a Wine & Dine package (CAD$196) that includes wine at each meal plus free sodas, juices, etc. for kids under age 6 or spend CAD$99 for a non-alcoholic beverage package including bottled water for your older crew. Rates vary according to travel dates and your point of departure, but if you book by September 30th there’s a 15% discount. This brings the fare to CAD$721 per person, but there is an additional whopping port tax of CAD$590. However, if you decide to go and book by December 31st (a Christmas surprise? ), you can take 10% of all fares. The 2014-2015 season runs December 19th, 2014 through to March 30, 2015, departing every Monday from Havana and every Friday from Montego Bay, Jamaica. This offer is certainly valid for citizens of most countries, but U.S. passport holders should confer with a travel agent regarding the cultural exchange visas that many U.S. travelers are required to have. For cruise and air packages from other international gateways, visit YourCubaCruise.com. For more information about Cuba Cruise and to book directly, visit their website or call 855/364-4999.